Freestyle is the fastest of the competitive strokes. In competition, however, swimmers often try to speed up by moving their arms faster through the air. They try so hard that their strokes deteriorate, slowing them down. Getting enough air while swimming in open water is critically important. This drill and the next two drills are designed to help you improve your head and body position so that you can breathe effectively in open water. To develop strength in the lats and the muscles of the upper back, some of the most important muscles for generating the power behind your pull. Technique is critical in swimming performance. In the pool or open water, coaches and athletes alike know that efficiency in entering the water and in moving through it equates to milliseconds of improvement—milliseconds that make all the difference in a competition. That’s where The Swimming Drill Book continues to deliver. The first edition quickly became the best-selling drill book in the sport. Now, this second edition ups the ante with more drills, new variations, and expanded coverage to help every swimmer. Inside, you’ll find more than 175 drills for refining strokes, correcting faults, and improving your feel for the water. In addition to mastering all four competitive strokes—freestyle, backstroke, breaststroke, and butterfly—you’ll learn the essentials of body position, sculling, starts, turns, and finishes. You’ll even find all-new coverage of open-water drills and strength band workouts to be performed poolside. 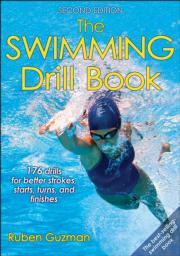 See for yourself why The Swimming Drill Book is on the shelf of every serious swimmer and coach. It delivers every stroke, every skill, and everything you need for swimming success. This book is primarily aimed at swim coaches at the age-group, high school, small college, and masters levels. Secondary audiences are swimmers at these levels and multisport athletes, including triathletes. Ruben Guzman is a United States Swimming (USS) coach for age-group swimmers. He has coached swimming for over 35 years at the summer recreational, high school, collegiate, and competitive year-round USS levels. Over the years, Guzman’s teams have won numerous championships, and dozens of his swimmers have gone on to compete at the collegiate level. His athletes have advanced to nationals and Olympic trials. Recognized worldwide as an expert in stroke technique, Guzman served as the stroke specialist for the California Capital Aquatics team and worked closely with retired head coach Mike Hastings, an assistant coach on the 1992 U.S. Olympic team. In 2008, what was to be his final year of coaching at the high school level, Guzman’s swim team at Christian Brothers High School (Sacramento, California) qualified 22 of its 33 swimmers for the state championships. Ever the teacher, in 2016, Guzman came out of retirement to coach his son’s high school team. He continues to conduct clinics and trainings for swim teams and coaches. Guzman holds a bachelor’s degree in biological sciences from California Lutheran University and a master’s degree in public health from UCLA, specializing in behavioral sciences and health promotion. In addition to his swimming expertise, Guzman is author of the book Evolving Health and is a professional speaker and consultant specializing in leadership development, communication, health promotion, and productivity for leaders and their organizations.